GOLDEN GATE ESTATES — A Golden Gate Estates animal preserve already in trouble with Collier County code enforcers over zoning issues has been found out of compliance with federal animal welfare laws. A routine inspection May 23 by the U.S. Department of Agriculture found the Kowiachobee Animal Preserve wasn’t following veterinarian instructions for the care of a lion cub and a tiger cub with a bone disease and fractures, and also wasn’t feeding the cubs an appropriate diet for their condition. 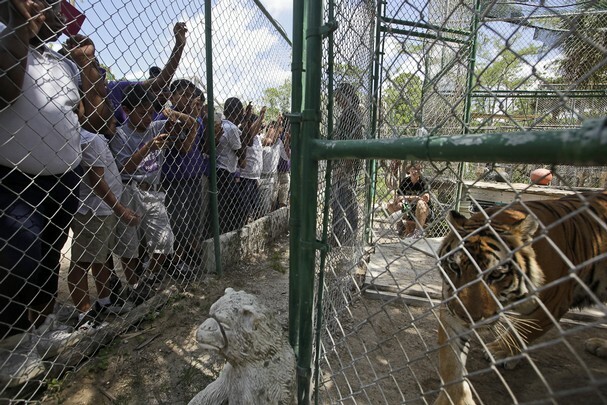 Inspectors said there were inadequate barriers between the cubs and public at the preserve and at an exhibition at a business plaza. Inspector Robert Botelho couldn’t be reached for comment Friday. USDA spokesman Dave Sacks couldn’t confirm whether the preserve had corrected the problems since May 23 or whether the preserve had been reinspected since then. Sacks said the preserve doesn’t face fines. “You’re always going to have some kind of concerns from USDA,” Slaby said. Kowiachobee has stopped offering public tours of the preserve after Collier County code enforcers said the preserve generated too much traffic to comply with the county’s rules for home-based businesses. The preserve can keep its animals — more than 100 of them, from pigs to lions — but must exhibit them off-site. 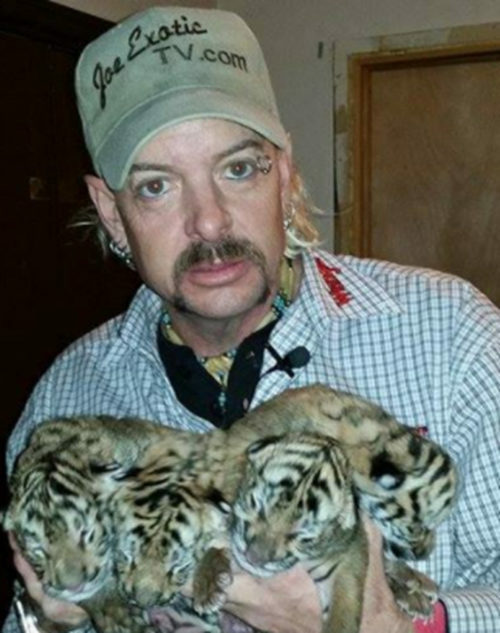 Two of Kowiachobee’s denizens, a male tiger cub named Subaliczar and a male lion cub named Shaunbay, are the focus of the detailed, four-page USDA inspection report. Slaby said the two cubs, born in November and December last year, were bought and donated to the preserve. In April, the cubs were found suffering from a bone disease that had left them with multiple leg and rib fractures. A veterinarian ordered they be put on full cage rest in a small dog kennel for the next few months and get a new diet. But during the May 23 inspection, Botelho wrote, he saw the two cubs in Slaby’s living room with another lion cub nearby and found no evidence that they had been rechecked as ordered by the veterinarian. The report indicates the cubs were put in their cages during the inspection, and the inspector gave Kowiachobee until June 7 to have the cubs rechecked by a veterinarian and put on a better diet. Slaby said the diagnosis of bone disease “caught us off guard.” He said he has consulted with experts at the University of Miami and the University of Florida to find the right mix of food and supplements for the cubs. Greg Kahn/Staff One of the panthers walks around its cage at Kowiachobee Animal Preserve in Golden Gate Estates on Friday, May 11, 2012. John Slaby and his wife, Grace, the directors of the preserve, are in a battle with Collier County code enforcement over the zoning of the preserve’s property and whether they are allowed to continue to give tours to the public. Greg Kahn/Staff Children from Village Oaks Elementary School watch as Michelle Augustyn, center, a volunteer, uses a branch to play with one of the panthers during a tour of the animals at Kowiachobee Animal Preserve in Golden Gate Estates on Friday, May 11, 2012. John Slaby and his wife Grace, the directors of the preserve, are in a battle with Collier County code enforcement over the zoning of the preserve’s property and whether they are allowed to continue to give tours to the public. As for the handling of the cubs, the inspection report found that they weren’t being exhibited “with minimal risk of harm to the animal and to the public” as required by federal law. The two cubs were walking freely around the preserve and people were petting them; the lion was on exhibit with a leash at a business plaza the week before the inspection, the report said. The report also cites a news video that showed one handler sitting with the lion cub on a loose leash and a handler walking the lion cub with people nearby. 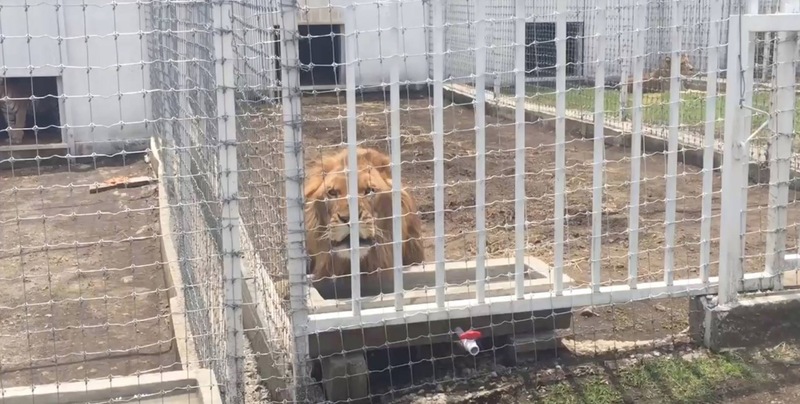 The lion wasn’t in “direct control” of the handler, as required by federal law, inspectors found. The lion and tiger — both more than 40 pounds in April — are strong and quick enough to lunge at people and injure them, the report said. Inspectors also gave Kowiachobee until June 15 to fix “wide openings” under gates and barriers in front of the cages housing a cougar, leopard and jaguar. 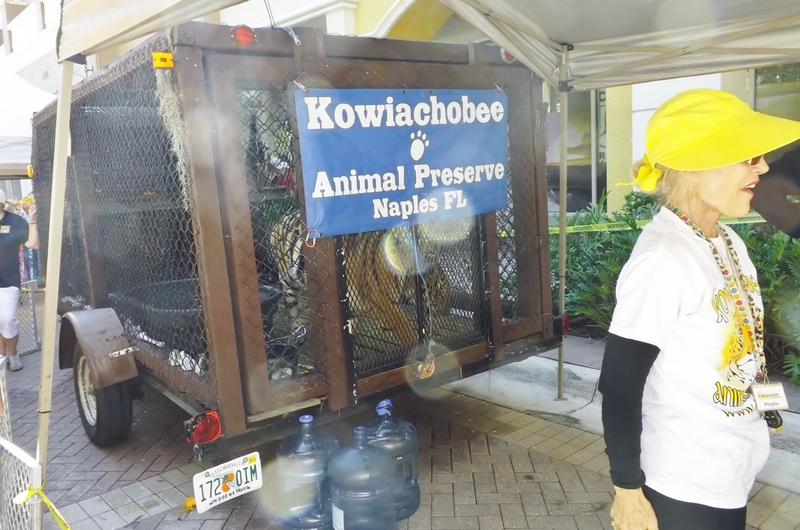 Bookkeeping oversights and enclosures in need of repair are typical USDA inspection findings, but the concerns about care of the cubs are more startling, said Nick Atwood, campaigns coordinator for the Animal Rights Foundation of Florida.